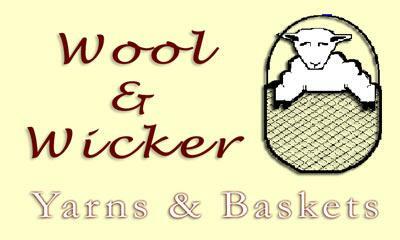 Wool & Wicker is a yarn and basket retail store that has been open since May 1998 in the historic fishing village of Steveston, a community in Richmond, BC, Canada. We offer the beginner and passionate knitter a wide variety of yarns for all tastes and budgets. We carry yarns by many different manufacturers in all weights and fibers for knitting, crochet and weaving projects. To see the lines we carry, and prices, go to our yarns section. Extensive selection of old and new knitting books and magazines, lanternmoon.com, and Bolga and some decorator baskets, "Skacel's" (skacelknitting.com), Addi Turbo knitting needles in all sizes and styles, Addi Turbo Clicks, Addi Turbo Rockets, Addi Bamboo Natura Clicks, and Addi Lace Clicks and Long Lace (all interchangeable needles in a case) and their additional needle tips, a set of crochet hooks which can connect to the click cords and be used for tunisian crochet or knitting needle one end and hook the other, and their Zitron, Schoppel, and Hikoo yarns, Anadiomena from Ravelry's patterns and Colour Adventures yarns, Clover knitting accessories, Eucalan, Skacel's Blue Moon and Renaissance buttons, Fiber Trends patterns, Cat Bordhi Books (New Pathways softcover), Rowan and Kim Hargreaves knitting pattern books,Sirdar knitting patterns and booklets, Churchmouse Patterns, Schoppel Artfelt Fibers, Lothlarian possum socks, a full line of locally made all natural wool Padraig slippers, from newborn to xlarge mens www.padraigcottage.ca shawl pins, thera-gloves, and many other knitting needs, like Eucalan woolwash, every product Addi produces, lots of our best selling Hikoo Cobasi in all 3 weights, Simplicity, Simpliworsted, Caribou, plus Schoppels Zauberball, Crazy, Starke 6, Lace weights, and many of the Zitron yarns, like Trekking, Ambiente, and Unisono, and the new Yak, Feinheit, . Noro yarns galore, Rowan Brushed Fleece, Fine Lace, Brett Marble Chunky, Hayfield Blossom dk, bulky and Baby Changes, Snuggly dk and Baby Bamboo and Crofter, Malabrigo Rasta, Caracol. Check out our classes, which are ongoing, and currently are taking place Wednesday nights, Friday mornings, Saturday afternoons, some Sundays, and we have Monday and Tuesday nights available as well. Get some friends together and come and join our wonderful teachers and learn new techniques with other like minded folk! You don't have to learn and knit alone! We do mail order. All of our yarns are available by the ball. We also offer a wide range of group classes. While you are here, become a "Passion Knitter's Club" card carrier, and accumulate purchases for discounts and a once a year draw for a $50 gift certificate for the store. The store is located in Steveston, a nostalgic refuge and historic fishing village in the southwest corner of Richmond, twenty minutes from the Vancouver airport, on the Gulf of Georgia. Take No.1 Road south of Steveston Highway, turn right at Chatham and then left on Second Avenue. We are halfway down the block on the right hand side. Look for the painted scene window. Park behind building if no space available. Leave yourself time to visit the fresh fish dock, the local park and playground, and shop the unique gift, book, toy and fashion stores, or tour the Gulf of Georgia Cannery. Try great eats at one of our 64 wonderful food venues, and wear off the calories with a stroll around Garry Point Park to watch the sunset, the kite flyers and the boats along the Fraser River. Be sure to take in the Farmers and Artisan's Market every other Sunday from 11-4PM from May until october. For more info see www.sfam.ca. Call the Wool & Wicker toll free Can./US# 1-877-966-5945 or locally, 604-275-1239, and give your order to a real person, or leave your message, and we can mail anything to you, and take your Mastercard, Visa or money order. Satisfaction guaranteed!